Note the chart plotter pretty much blocking the forward view. There seems to be a trend these days on cruising boats: piling crap on the steering pedestal*. First of all, for those who don't know, the steering pedestal is where the wheel of the boat is. It is where you steer. There is usually a stainless steel upside-down "U" shape and the wheel (and whatever else) is attached to that. It's much more complex, of course, but that's not the point of this post. The point is: many, many people turn the steering pedestal into a gadget collector and we're not fans of this. There is logic for why people do this; the pedestal is right by the helmsperson, aka, the driver. By piling all the gadgets and their gauges on said pedestal, the "driver" can easily adjust and tinker with the autopilot, chartplotter, stereo, flux capacitor and whatever else they decide to mount up there. I guess it makes sense, but it doesn't mean that we like it. One of the very first things Scott and I whispered to one another when we boarded Asante was "we're moving that chartplotter!" (what can I say? We think alike). You may or may not be able to tell from the above picture, but that sucker is huge. 15 x 12 inches huge. We like a clear view ahead. Many boating accidents actually occur because people are staring at their chartplotters and not at the water around them. We did not like the placement of our chart plotter one bit. So... we removed and remounted it. 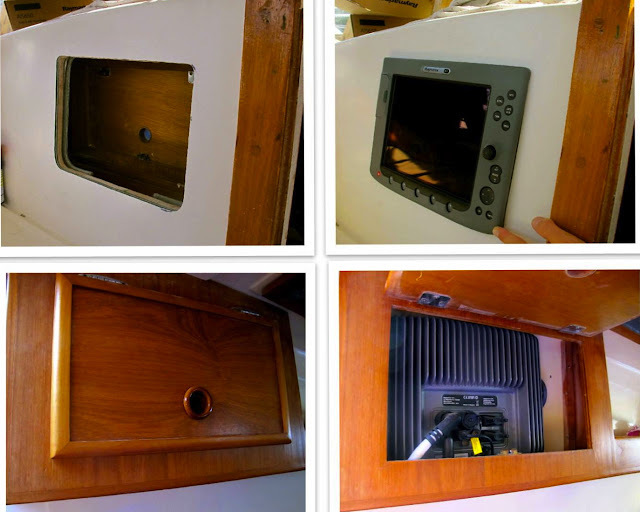 We cut a giant hole in our boat and flush mounted the unit (which is slightly smaller than the 15 x12 box it was in before) on the port side of the companionway where it will still be visible by the helmsperson, but not too close that it will disrupt the driver's focus and night vision. What makes it even more perfect is the fact that there is a pre-existing tiny cupboard behind it so if we need to access the wires, all we have to do is open the cupboard. We were concerned it wouldn't be deep enough but you know what? It fit like a dream. Like it was made to go there. It's not every day that you can say that on a boat! I'm sure there are a lot of people out there who would say we were totally nuts and/or stupid to cut a hole that large in our boat (and trust me, it's not easy to do - mentally and physically! ), but we think this is a much cleaner, nicer set-up. Our pretty pedestal is clutter free now, just how we like it. *Boats with tillers do not have this problem. I agree with the pedestal issue. As a guy who's done some core repair, though, I just gotta ask if you sealed the exposed core in your new cutout before mounting the unit? Things are looking good! Have fun with the new boat! Great question!! Yes, we did!! We had some core repair to do on this deck as well so we are also careful about that!! Thanks! We mounted our 7" Raymarine on the pedestal, low behind the wheel, about 7 inches below the compass. Most chartplotters interfere with the compass. When we need to reference the screen, we just look down a bit. At this location, there is no interference to the compass or your sight line. Don't know how folks can stand having that screen in your face when sailing. Another bonus: you've made it more difficult to steal. That's better for Your eyes too not having to look upwards which would easily make Your eyes dry. @Paul - yes, we have our autopilot mounted on the pedestal, but it's small and low as well...the chartplotter was like a friggin' tv up there!! @MoreJoy - YES!! Great point! I'm about to do the same setup on my Westsail 43. My cockpit is short and my eyes don't see as well up close without bifocals, so I will be able to both see and reach my display without any trouble if it is on the end of my cabin trunk. Plus it will be up under the dodger in rough weather. In addition, my binnacle guard is straight (no bend) and I do not want to bend it forward or replace it just to accommodate a display. It's present configuration is perfect for walking on the cockpit seats full circle around the helm without letting go of the guard.